Original Editors - Chelsea Reed & Tory Schwartz from Bellarmine University's Pathophysiology of Complex Patient Problems project. An acute, life-threatening exacerbation of thyrotoxiosis. This condition is rare now due to more efficient diagnosis and treatment of thyrotoxicosis in addition to improved management pre and post surgery. When it does occur, it is following illness, trauma, surgery or other major physiological stress in an individual with existing thyrotoxicity. Thyroid storm occurs most commonly in those with uncontrolled or undiagnosed thyrotoxicity with an added precipitating factor. Individuals with a history of hyperthyroidism, Graves' disease, toxic multinodular goiter, adenoma or any other cause of endogenous thyrotoxicity are at the highest risk for experiencing a thyroid storm. Rare, but high mortality rates at 10-20%.1 Currently, incidence may be as low as 0.2 cases/100,000 population. 5 More common in women than men (10:1). Thionamide: blocks the production/release of the thyroid hormone, as well as the conversion of T4-T3. Iodine: blocks the conversion of T4-T3. IMPORTANT: This MUST only be given 1 hour after PTU has been administered. Iodine is a substrate in the production of the thyroid hormone and could make the situation worse if given before the production has been stopped with the use of PTU. Steroids: block the peripheral conversion of T4 to T3 and in addition boosts the hypothalamic pituitary access. IF lab tests are performed TSH values with be low to undetectable and T4 will be high. Thyrotoxicity occurs when there are abnormally high levels of thyroid hormone circulating within the body, most often due to overactivity of the thyroid gland. Graves’ disease is the most common form of thyrotoxicosis that leads to a thyroid storm. Other causes include multinodular goiter and toxic adenoma. 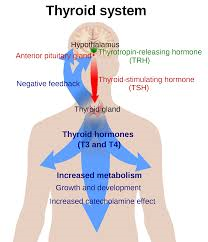 The full pathophysiology of thyroid storm is unknown, but the exposure of increased numbers of beta1-adrenergic receptors to heightened catecholamine levels during times of stress is thought to play a role. Another cause is thought to be involved with the displacement of free thyroid hormones by inhibiting cytokines during illness. When medical attention is required? What should be monitored during treatment session? Vital signs including: blood pressure, heart rate, and respiratory rate. Other signs: excessive sweating, shortness of breath, abnormal tenderness with palpation of the thyroid gland, abnormal heart sounds, fever, tremor, and any of the clinical signs listed above. Case report of an 18 year old female who was 1 year post diagnosis of Graves’ Disease and was underwent elective thyroidectomy surgery. 30 minutes into the surgery the patient’s heart rate and temperature started to rise. Treatment was performed to combat the thyroid crisis and the surgery to remove her thyroid was completed. Thyroid storm triggered by a gastrointestinal perforation in a 55 year old Japanese man. Admitted to the hospital for leg edema and acute severe abdominal pain. On arrival he presented with tachycardia with a goiter, altered consciousness, atrial fibrillation, and swelling of the abdomen. Case report of a 50 year old woman who experienced a thyroid storm during anesthesia induction for a humeral fracture repair. Patient presented with no history of hyperthyroidism nor abnormal signs preoperatively. However, reported weight loss, intermittent palpitations, and hand tremors for the past year. ↑ 5.0 5.1 5.2 5.3 5.4 Carroll R, Matfin G. Endocrine and metabolic emergencies: thyroid storm. Therapeutic advances in endocrinology and metabolism. 2010 Aug;1(3):139-45.